Some processes of energy saving and expenditure occurring during ethanol perfusion in the isolated liver of fed rats; a Nuclear Magnetic Resonance study. In the isolated liver of fed rats, a 10 mM ethanol perfusion rapidly induced a rapid 25% decrease in the total ATP content, the new steady state resulting from both synthesis and consumption. The in situ rate of mitochondrial ATP synthesis without activation of the respiration was increased by 27%, implying an increased energy demand. An attempt to identify the ethanol-induced ATP-consuming pathways was performed using 31P and 13C Nuclear Magnetic Resonance. Ethanol (i) transiently increased sn-glycerol-3-phosphate formation whereas glycogenolysis was continuously maintained; (ii) decreased the glycolytic ATP supply and (iii) diminished the intracellular pH in a dose-dependent manner in a slight extend. Although the cytosolic oxidation of ethanol largely generated H+ (and NADH), intracellular pHi was maintained by (i) the large and passive excretion of cellular acetic acid arising from ethanol oxidation (evidenced by exogenous acetate administration), without energetic cost or (ii) proton extrusion via the Na+-HCO3- symport (implying the indirect activation of the Na+-K+-ATPase pump and thus an energy use), demonstrated during the addition of their specific inhibitors SITS and ouabaïn, respectively. Various cellular mechanisms diminish the cytosolic concentration of H+ and NADH produced by ethanol oxidation, such as (i) the large but transient contribution of the dihydroxyacetone phosphate / sn- glycerol-3-phosphate shuttle between cytosol and mitochondria, mainly implicated in the redox state and (ii) the major participation of acetic acid in passive proton extrusion out of the cell. These processes are not ATP-consuming and the latter is a cellular way to save some energy. Their starting in conjunction with the increase in mitochondrial ATP synthesis in ethanol-perfused whole liver was however insufficient to alleviate either the inhibition of glycolytic ATP synthesis and/or the implication of Na+-HCO3- symport and Na+-K+-ATPase in the pHi homeostasis, energy-consuming carriers. The total ATP hepatic content rapidly decreased to reach 75% of the baseline level about 30 min after the beginning of 10 mM ethanol perfusion in the isolated liver of fed rats , thus characterizing a new energetic steady state. We have recently demonstrated  that at this steady state in the presence of ethanol, the rate of mitochondrial ATP synthesis increased without activating the respiration, leading to an enhanced ATP/O ratio. Besides oxidative phosphorylation, glycolysis is known to provide nearly 30% of the total ATP liver content in physiological conditions . Since hepatic glycogenolysis occurs in the presence of ethanol as demonstrated in isolated hepatocytes , subsequent glycolysis could then supply some ATP until all the stored carbohydrates are oxidated. However, in fed rats the glycolytic ATP production has been reported to be diminished in isolated livers perfused with ethanol  and in isolated hepatocytes from ethanol-fed rats [5, 6]. Hence, ATP production in the presence of ethanol might be mainly mitochondrial and the observed increase in its rate  at the new steady state might reflect an increase in ATP consumption in the whole liver, since at a steady state the net ATP consumption rate equals the net ATP synthesis. These findings raise the issue of the involvement of the ethanol-induced ATP-consuming pathways. Could the question concern the regulation of the redox state since many of the effects of ethanol on metabolism result from the large production of protons and from the decrease in the [NAD+] / [NADH] ratio in the cytoplasm occurring during its oxidation? Ethanol has been demonstrated to decrease the [NAD+] / [NADH] ratio in the cytoplasm 5.5-fold 5 min after an intraperitoneal administration corresponding to 10 mM in total body water . Special shuttle systems are required for mitochondrial oxidation of cytosolic NADH+H+. For example, ethanol oxidation results in an increased concentration of hepatic sn-glycerol-3-phosphate (G3P) [7–9], a rise that has been associated with the very large changes in the redox and phosphorylation states, according to simple thermodynamic laws . However, a main implication of the shuttle systems could lead to an increase in the organ respiratory activity. Since liver respiration was only transiently and slightly increased at the beginning of ethanol addition, the question arises as to whether other systems play an important role in H+ transfer processes between the cytosol and the mitochondria and/or the cell in order to avoid intracellular acidosis. Using continuous noninvasive 31P and 13C Nuclear Magnetic Resonance (NMR), the present work shows in real-time that, during the ethanol oxidation, besides dihydroxyacetone phosphate/G3P shuttle involved in the regulation of the redox state, systems involved in the intracellular pH homeostasis are required: the passive extrusion of acetic acid is a way used by the liver to save energy, whereas the cell membrane proton carriers (Na+-HCO3- symport and Na+-K+-ATPase) are energy-consuming systems. In the absence of carbohydrates in the perfusate, the apparent rate of glycogenolysis evaluated by the changes in the area of glycogen C-1 NMR resonance was 0.90 ± 0.08%/min (n = 4) in the control KHB group (100% being considered as the initial content = 73 ± 8.50 μmol.g-1 glycosyl units, n = 8). After the initial 30 min KHB perfusion, the remaining amount of glycogen (60–75%) when the ethanol was added could potentially ensure glucose supply for glucose excretion and/or glycolytic activity. In order to compare the apparent rate of glycogenolysis, 10 mM ethanol or 2-min IAA (0.5 mM) were added to KHB; glycogenolysis occurred in the same extent [0.78 ± 0.13%/min (n = 4; NS vs KHB) and 0.85 ± 0.08%/min (n = 5; NS vs KHB), respectively]. 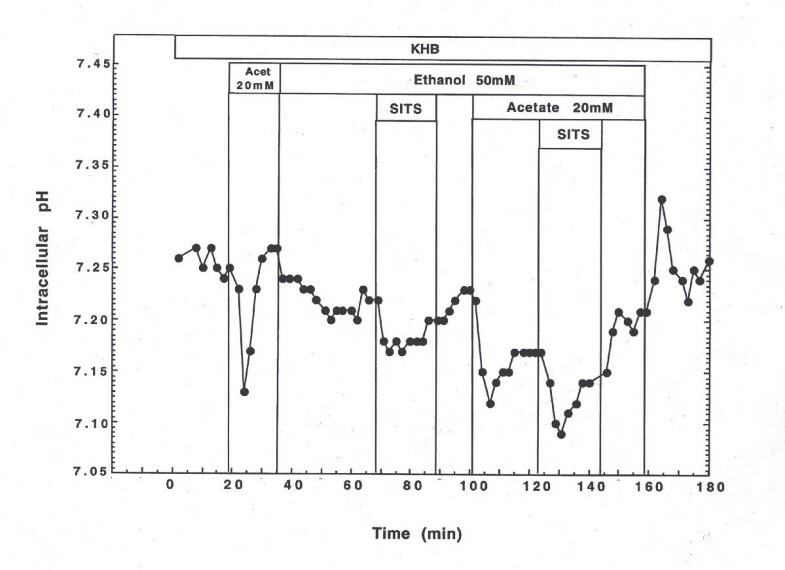 Glucose excretion was 1.71 ± 0.40 μmol/min.g ww during the equilibration period, and was not significantly changed throughout the perfusion of KHB or ethanol, nor when 2 min- IAA (0.5 mM) was added. Since glycogenolysis and glucose excretion were unchanged when glycolysis was inhibited, the question arises as other pathways for glucose utilization. The change of the signal of phosphomonoesters (PME; 3.83 ppm) is mainly representative of that of sn-glycerol-3-phosphate, by-product of glycolysis (provided from dihydroxyacetone phosphate [DHAP]). As shown in Figure 1, the suppression of glycolysis with 2-min IAA (0.5 mM) addition in the KHB group (n = 3) led to a moderate 5–10% increase in the PME peak. A 20–30% increase occurred under ethanol perfusion (n = 3) without any significant dose-dependent effect in the range of 10–100 mM. The conjunction of ethanol and 2 min-IAA perfusion allowing the total inhibition of glycolysis (n = 3) amplified this increase by a maximum of 40–50% (Fig 1 and 2). In all groups, the maxima of these transient increases were reached after 10–20 min perfusion. 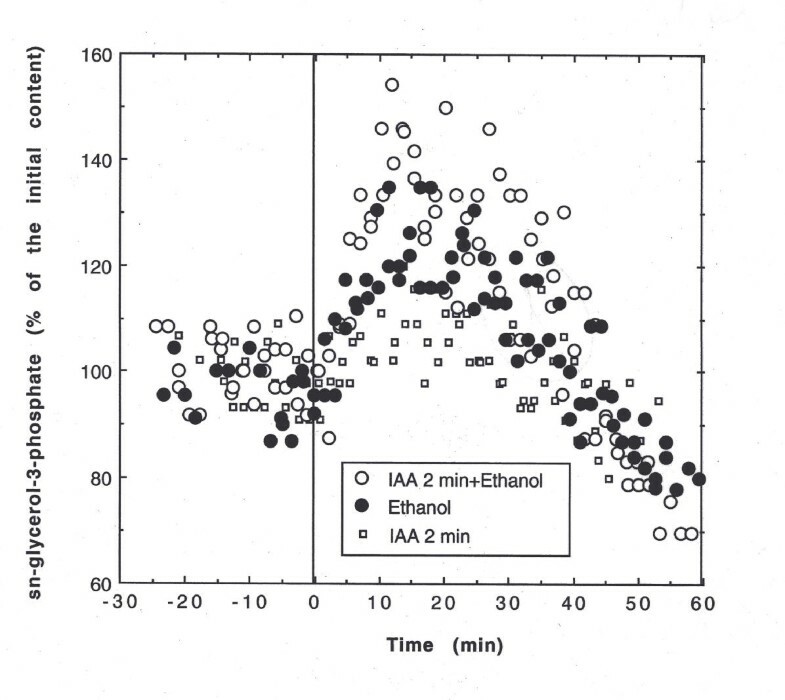 Effect of ethanol and/or IAA on the time-course of phosphomonoester levels. PME resonance (sn-glycerol-3-phosphate) was measured in the following perfusion conditions: (i) IAA 0.5 mM for 2 min (n = 3), (ii) ethanol (with no dose-dependent effect in the range 10–100 mM; n = 3) and (iii) 2 min IAA immediately followed by the ethanol perfusion (n = 3). 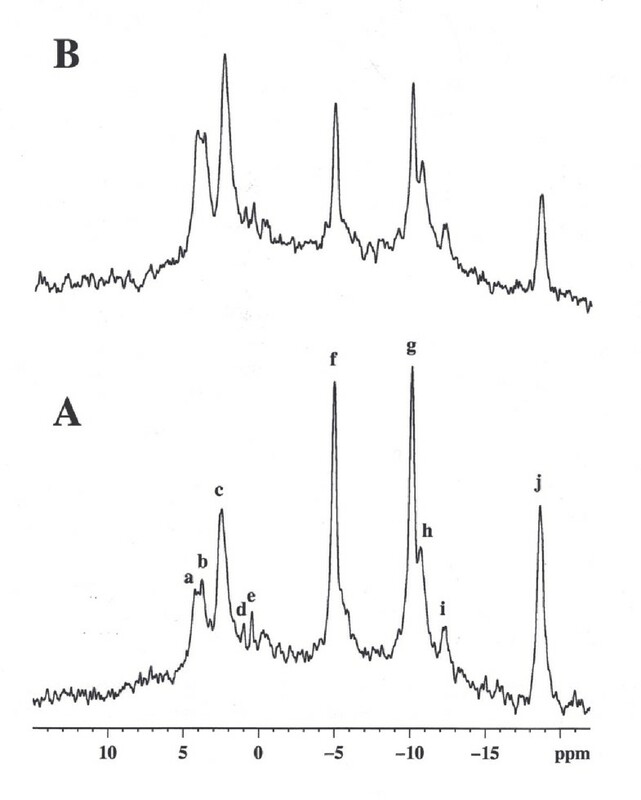 31 P NMR spectra of an isolated rat liver perfused at 37°C: (A) under initial 30 min-KHB perfusion; (B) after 15-min perfusion in presence of ethanol (10 mM) immediately following 2 min IAA (0.5 mM) perfusion. Major resonances were assigned to (a) phosphomonoesters, mainly sn-glycerol-3-phosphate; (b) phosphocholine; (c) intracellular inorganic phosphate (Pi); (d) glycerol 3 phosphoryl ethanolamine; (e) glycerol 3 phosphoryl choline; (f) nucleoside-5'-triphosphates (γNTP) and diphosphates (βNDP); (g) αNTP and αNDP; (h, i) nicotinamide adenine dinucleotide, uridine 5' diphosphoglucose and derivatives; (j) βNTP. The external reference (methylene diphosphonic acid) is outside of the spectral window (18.40 ppm). In order to stimulate the formation of DHAP, the oxidative phosphorylation is inhibited by addition of KCN (2.5 mM; inhibitor of the cytochrome oxidase). The glycolysis was enhanced to compensate the ATP supply; the by-product PME was then increased, as observed in KHB group (30 ± 3%; n = 5). The subsequent addition of ethanol led in 30 min to a dramatic and transient increase of PME (227 ± 45%; n = 3; P < 0.02 vs KHB). Representative 31P NMR spectra obtained during KHB perfusion are presented in Figure 2A. The addition of ethanol after the 30 min initial KHB perfusion enhanced the initial rate of net total ATP consumption (Vi = 100 ± 12 nmol/min.g ww, P < 0.001) as compared to KHB (Vi = 6.0 ± 0.12 nmol/min.g ww, n = 20), whatever the range of concentration studied (10–100 mM). The ATP content stabilized at 75 ± 3% (n = 16) of the initial ATP level after about 20–30 min. The new steady state of ATP content-mainly representative of cytosolic ATP-observed was independent of the concentration of ethanol used, and was characterized by a slight net consumption of the total ATP similar to that of the KHB control. On the other hand, addition of ethanol induced an increase in the fraction of the form of ATP bound to divalent ion (bound ATP), F=bound ATP/total ATP, as shown in the upper graph of Figure 3 (typical experiment performed with 100 mM). Under the initial KHB condition, the difference between total and bound ATP was 11% and was reduced about 15 min after alcohol-addition to reach 6% at the end of experiment. The increase in the bound ATP/total ATP ratio observed under ethanol perfusion was unexpected and an explanation such as Mg2+ leakage from mitochondria remains to be validated in further investigations. 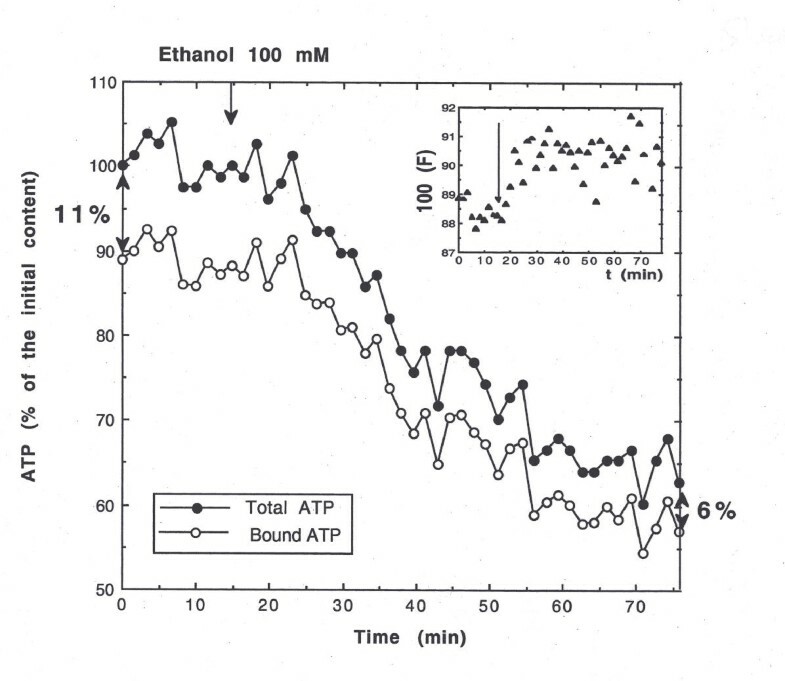 Representative experiment of the effect of 100 mM ethanol on the time-course of total and bound ATP. The differences between total and bound ATP are indicated with vertical arrows in the initial KHB condition and after ethanol perfusion. The upper internal figure represents the evolution of the fraction of the bound form. The beginning of ethanol perfusion is indicated with the arrow; F = bound ATP/total ATP. The suppression of glycolysis by 2 min-IAA (0.5 mM) in KHB group decreased the liver ATP content to reach a new steady state [77.2 ± 3.1% (n = 6) of the initial ATP level]; the ΔATP was about 20% between the two steady states (KHB-IAA). As previously demonstrated , addition of 2 min- IAA (0.5 mM) in ethanol-perfused livers (n = 5) slightly decreased the liver ATP content, leading to a ΔATP of about 4% between the two steady states (ethanol-IAA). This evidenced that ethanol has strongly reduced glycolytic ATP production before the IAA addition. This effect was also demonstrated when glycolytic ATP production was previously stimulated by inhibition of the oxidative phosphorylation (2.5 mM KCN). In the KHB group (n = 3), KCN addition rapidly led to a new steady state of the ATP content (around 45–65% of the initial content). ATP was supplied until glycogenolysis and glycolysis remained active. The subsequent addition of IAA (0.5 mM during 2 min) to KCN (n = 3) led to the total inhibition of the residual glycolytic ATP synthesis, as expected. 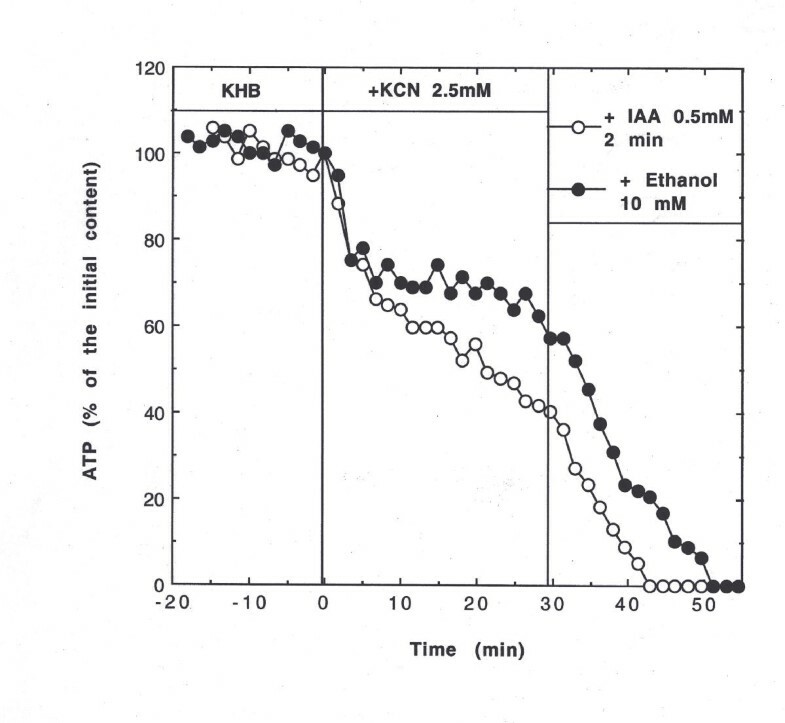 The subsequent addition of 10 mM ethanol (instead of IAA) to KCN led to a similar decrease of the ATP content, thus confirming the inhibition of glycolysis by ethanol. Representative experiments are shown in Figure 4. Effect of ethanol on glycolysis followed by the total hepatic ATP content by 31P NMR. One typical experiment per group: effect of IAA (0.5 mM; 2 min) or 10 mM ethanol. The sequence was (i) initial perfusion with KHB, (ii) inhibition of oxidative phosphorylation with KCN (2.5 mM during 30 min) and (iii) effect of IAA or ethanol on residual glycolytic ATP. The average pHi value was 7.20 ± 0.06 (n = 15) under KHB perfusion. Ethanol led to a slight dose-dependent decrease in pHi, with a maximum of -0.069 pH units obtained from 50 mM ethanol, the ethanol concentration for the half-maximum effect on pHi being around 13 mM (Figure 5). A plateau of the pHi was obtained within 15–20 min. Ethanol induced also an acidification of the effluent from the beginning of perfusion with variation from -0.05 to -0.10 pH units. Ethanol dose-dependent effect on hepatic intracellular pH (pHi). The upper internal figure represents the change in ΔpHi (= pHiKHB – pHiEtOH) where pHiKHB and pHiEtOH are the pHi values in KHB and ethanol, respectively. The double-reciprocal plot in the main part of the figure indicate estimated maximal ΔpHi and K0.5. The role of Na+-HCO3- symport was only investigated because we have already and clearly demonstrated in the model of the perfused rat liver that in our physiological perfusion condition the Na+-HCO3- symport was mainly implicated in the pHi homeostasis, and the Na+-H+ antiporter activity was negligible at physiological pH and was activated below pHi 7.00 or in absence of bicarbonate in the medium . Moreover we have also demonstrated using bicarbonate-free perfusate that the cycling of endogenous production of bicarbonate resulting of hepatic metabolic activity was sufficient to maintain the Na+-HCO3- symport activity thus contributing to cytosolic pH regulation concomitantly with that of Na+-H+ antiporter . We have checked the inhibition of Na+-H+ antiporter during ethanol perfusion with amiloride 1 mM, dimethylamiloride 1 mM or isopropylamiloride 2.5 10-4 M: no effect was observed on the pHi. In a characteristic experiment shown in Figure 6, a high concentration of ethanol (50 mM) slowly decreased the pHi value leading to a plateau reached within 15 min, with a ΔpHi = -0.05 pH units at the steady state. The subsequent addition of SITS 1 mM, already demonstrated to efficiently inhibit the Na+-HCO3- symport in the perfused rat liver [10, 11], reduced the pHi instantly (<2 min) but transiently (15–20 min), the variation being -0.05 pH units. This evidenced the involvement of the HCO3- uptake in pHi regulation, as in a control group (KHB+SITS; ). However, in the control group (data not shown), the decrease in pHi was slow (the nadir was reached after 10–12 min), characteristic of a less intense efflux of protons (about 2-fold lower). Moreover, the transient effect in presence of ethanol suggested that another mechanism alleviated the inhibition of the symport. After rinsing with ethanol, the pHi was recovered within 10 min. Effects of 1 mM SITS, an inhibitor of Na + :HCO 3 -symport, and 20 mM acetate on the pHi regulation of an isolated rat liver perfused with 50 mM ethanol. This concentration was chosen in order to better visualize the effects on pHi. The high acetate concentration added during the initial KHB perfusion crossed the cell membrane only in protonated form (acetic acid) which was immediately dissociated in the cytosol owing to the difference between the actual pHi and its pKa, thus resulting in a pHi decrease (acid load). Conversely, at the beginning of the rinsing phase with KHB, the excess of cytosolic acetate flushed out of the cell as acetic acid form had trapped the cytosolic proton, resulting in a pHi increase. The addition of a 20 mM acetate in control conditions (KHB) led to a rapid and transient acid load, regulated by the cell membrane carriers (Figure 6), showing the acetate inflow into the cell. Addition of 20 mM acetate on 50 mM ethanol perfused liver rapidly decreased the pHi (-0.13 pH units) (and was accompanied by a 5+0.06% decrease of the ATP content). A slow and partial recovery of pHi occurred conversely to that observed when acetate alone was added to KHB. A rapid and transient increase in pHi was observed during the rinse phase at the end of the experiment showing the extrusion of acetate out of the cell. Exogenous acetate was expected to counterbalance the acetate gradient generated by alcohol oxidation. The partial recovery of pHi (+0.05 pH units) suggested that the excretion of endogenous acetic acid across the cell membrane contributed to the proton extrusion. In this condition, the contribution of the Na+-HCO3- symport was also evidenced, as shown by the effect of SITS. The addition of 1 mM ouabaïn, a specific inhibitor of the Na+-K+-ATPase, to KHB group induced no significant pHi change (n = 3). Addition of 1 mM ouabaïn to 50 mM ethanol perfused liver reduced the pHi after a 15 min delay, the maximum variation being -0.22 ± 0.08 pH units 20 min later (n = 3). During the effect of ouabaïn, the pH of the effluent increased, reflecting a decrease in the efflux of H+. The recovery of pHi was progressively obtained after a 25 min-ethanol rinse. This evidenced the indirect contribution of the Na+-K+-ATPase to pHi regulation during ethanol metabolism. The total ATP hepatic content (75% of the initial level) reached about 30 min after ethanol perfusion characterized a new energy steady state. In our experimental conditions in the absence of glucose in the perfusate, glycolysis depended only on the glycogenolytic activity, this latter indeed occurring in the presence of ethanol, as also demonstrated in isolated hepatocytes . Glycolysis might then supply some ATP until the whole carbohydrate store is oxidized, since no increase in glucose excretion was observed. The inhibition of glycolysis with IAA indeed induced a significant decrease (-20%) in the ATP content in the control (KHB) perfused livers. Moreover, the glycolysis inhibition with IAA in ethanol-perfused livers induced only a slight decrease (-4%) in the ATP content. Beside of previous works observing the ethanol-induced decrease of lactate and/or pyruvate excretion which demonstrated decrease in the glycolytic activity in ethanol-perfused liver isolated from fed rats  and in isolated hepatocytes from ethanol-fed rats [5, 6], the present work clearly evidenced that ethanol highly diminished the glycolytic ATP production. Hence, ATP production is mainly mitochondrial in the presence of ethanol. Since glycolysis was inhibited and no glucose excretion occurred whereas glycogenolysis remained active, the question arises as other pathways for glucose utilization. The interference of ethanol with the liver metabolism is to a large extent due to the NADH+H+ produced in the oxidation catalyzed by alcohol dehydrogenase in the cytosol and aldehyde dehydrogenase in the mitochondria. In the latter, the electron transfer system allows the reoxidation of NADH+H+ to NAD+. The reoxidation of cytosolic NADH involves the malate/aspartate and/or irreversible DHAP/sn-glycerol-3-phosphate shuttles, since the mitochondrial membrane is known to be impermeable to NADH. An alternative pathway for regeneration of cytosolic NAD, without the transfer of reducing equivalents to the mitochondria, is the reduction of pyruvate to lactate. It has already been demonstrated in perfused rat liver that 10 mM ethanol largely increase the lactate/pyruvate ratio, whereas glycolysis was inhibited as evidenced by a decrease in the release of lactate+pyruvate . In the present work, immediately after ethanol perfusion, PME content increased reflecting the large accumulation of sn-glycerol-3-phosphate as previously demonstrated [8, 9, 12, 13]. This ethanol-stimulated PME production evidenced, as when we have used IAA to inhibit glycolysis, the deviation of glycolysis to the DHAP/sn-glycerol-3-phosphate shuttle. However in all our experimental conditions, the PME content increase was transient. The subsequent decrease in the PME content could be due to (i) stimulation of the use of glycerol-3 phosphate in the synthesis of hepatic triacylglycerol specially in the presence of ethanol  and/or (ii) the decrease in the glycogen content. As consequence, it could be postulated that the metabolic effects of ethanol must be enhanced in absence of carbohydrate store (i.e., fast). As demonstrated in this work, ATP production in the presence of ethanol is mainly mitochondrial and the observed increase in its rate  at the new steady state might reflect an increase in ATP consumption in the whole liver, since at a steady state the net ATP consumption rate equals the net ATP synthesis. These findings raise the issue of the involvement of the ethanol-induced ATP-consuming processes. The activation of free fatty acyl CoA required for triglycerides synthesis could be one of them, but its contribution is probably minor. On the other hand, a concentration of 10 mM ethanol is known to produce a maximum rate of alcohol oxidation averaging 2–4 μmol/g.min-1 [7, 15, 16]. Hence it leads to 4–8 μmol/g.min-1 of NADH and H+ in the cytosol, the latter potentially representing a large acid load when respiration remains unchanged. Cytosolic ethanol oxidation leads to an excess of protons whose cellular extrusion stimulates mechanisms leading to ATP consumption via the activation of the Na+-K+-ATPase pump, which in turn extrudes the Na+. Indeed, a Na+ overload induced by ethanol observed in hepatocytes  results from the activity of membrane ionic carriers. In physiological conditions, in hepatocytes the active carriers are the the Na+-HCO3- symport and the Na+/H+ antiport, this latter being activated below 7.2–7.3 , whereas in the liver the activity of the Na+/H+ antiport is negligible above its set point of pHi 7.0 [10, 11]; other carriers such as Na/K/Cl cotransporter may be implicated. The Na+-K+-ATPase pump requires about 25% of the cellular ATP turn over and oxygen consumption in basal conditions [19, 20]. 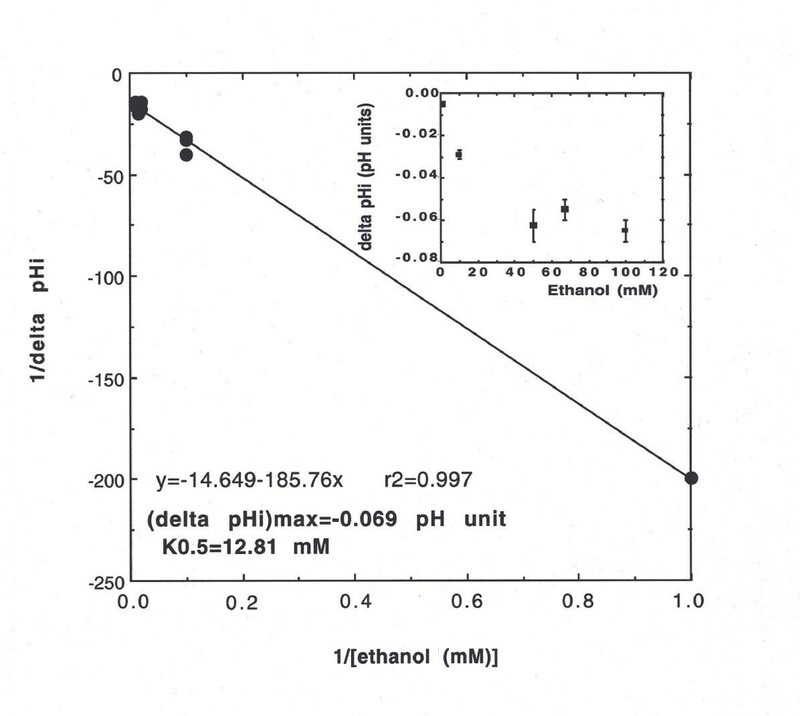 The pHi regulation from the beginning of ethanol perfusion was here demonstrated by (i) the slight dose-dependent decrease in pHi, with a maximum of -0.069 pH units and (ii) the expulsion of protons observed in the effluent. It has already been demonstrated by our team in the isolated liver  that acute ethanol administration under hypoxia dramatically accentuates the intracellular acidosis and the simultaneous ATP decrease; from this result, we can point out the contribution of ATP to pHi homeostasis in this condition. However, no detailed study concerning the involved mechanisms has been previously performed in an isolated perfused liver. In the present work, the cytosolic acidification induced either by SITS or ouabaïn evidenced for the first time in presence of ethanol a contribution of Na+-HCO3- symport to a rapid H+ elimination and Na+-K+-ATPase, respectively. It probably accounts for the ATP consumption observed at the onset of the alcohol perfusion. Beside of ATP-consuming processes, we clearly demonstrate that a cellular way eliminating protons saves energy. A concentration of 10 mM ethanol is known to produce a maximum rate of alcohol oxidation averaging 2–4 μmol/g.min-1 [7, 15, 16]. Hence it leads to 2–4 μmol/g.min-1 of acetate and to 4–8 μmol/g.min-1 of NADH and H+. It has been demonstrated that acetate ions arising from ethanol oxidation are barely metabolized in the liver, with 75–85% recovered in the effluent . Theoretically, the elimination of electronegative acetate ions from the liver during ethanol metabolism, mainly through acetic acid passive excretion, must necessarily result in the net output of intracellular H+ . Beside the energy cost relative to the contribution of Na+:HCO3- symport to H+ extrusion, our study of pHi regulation evidences that acetate excretion largely participates in the elimination of the proton excess arising from ethanol oxidation. The passive transport of acetate along its concentration gradient thus avoids a dramatic energy expenditure. Various cellular mechanisms diminish the cytosolic concentration of H+ and NADH produced by ethanol oxidation, such as (i) the contribution of the DHAP / sn- glycerol-3-phosphate shuttle between cytosol and mitochondria, mainly implicated in the redox state and (ii) the major participation of acetic acid in passive proton extrusion out of the cell. These processes are not ATP-consuming and the latter is energy saving. On the other hand, we have previously demonstrated an increase in mitochondrial ATP synthesis at the new steady state in ethanol-perfused whole liver . However, the ATP level significantly decreased at the beginning of the ethanol perfusion. So, by appropriate use of specific inhibitors of glycolysis, oxidative phosphorylation, Na+-HCO3- symport and Na+-K+-ATPase, we conclude that the different processes used by the liver to save energy during ethanol perfusion are probably insufficient to alleviate (i) the inhibition of glycolytic ATP synthesis or/and (ii) ATP-consuming membrane carriers implicated in the pHi homeostasis. Male Wistar rats (80–120 g) fed ad libitum were anesthetized by intraperitoneal injection of pentobarbital sodium (50 mg/kg of rat). The technique of non-recirculating liver perfusion through the portal vein (antegrade perfusion) was described previously . The liver (4–6 g) perfused with Krebs-Heinseleit (KHB) buffer at 37°C was excised from the abdomen and transferred into a 20 mm-diameter NMR cell. KHB was composed of (in mM) 120 NaCl, 4.70 KCl, 1.20 MgSO4, 25 NaHCO3, 1.20 KH2PO4-K2HPO4, 1.30 CaCl2, 0.30 Na-pyruvate and 2.10 Na-lactate (pH = 7.35 at 37°C). When any substrate or inhibitor was added, the perfusate pH was always adjusted. The perfusate was pumped through a Silastic home-made oxygenator (95% O2 + 5% CO2). Constant perfusion flow (5 ml/min.g liver wet weight) ensured good oxygenation of the liver as judged from the effluent oxygen concentration. Perfusate temperature and pH were monitored both before entering and after leaving the liver by continuous-flow pH and temperature electrodes. The standard sequence protocol at 37°C was as follows: (i) initial KHB perfusion (30 min), (ii) addition of ethanol (70–90 min) in a 1–100 mM concentration range. The contribution of the glycolytic pathway to ATP production was estimated in real-time by using 0.5 mM iodacetate (IAA), an inhibitor of glyceraldehyde-3 phosphate dehydrogenase activity. IAA was added within 2 min in the following conditions: (i) after a 30-min perfusion of KHB and (ii) after a 30-min perfusion of ethanol. However, other sequences of IAA addition have been applied in this study according to the goal. These sequences will be specified with the results. For instance, in order to better analyze the contribution of the glycolytic pathway in presence of ethanol, the oxidative phosphorylation was inhibited in a first step by addition of the specific inhibitor of the cytochrome oxidase (KCN, 2.5 mM) leading to an increase of the contribution of glycolysis alone to the ATP supply. When the new steady state was obtained, ethanol 10 mM was added and compared to an addition of 0.5 mM IAA (2 min). When necessary, the other sequences will be detailed. The contribution of acetic acid and Na+-HCO3- symport to pHi regulation in the presence of ethanol (50 mM) was respectively studied by (i) reducing the intra-extracellular acetate gradient with the addition of 20 mM acetate in the perfusate, and (ii) using 1 mM 4-acetamido-4'-isothiocyanostilbene-2,2'-disulfonic acid (SITS), an inhibitor of the symport. The indirect contribution of Na+-K+-ATPase pump to pHi regulation in the presence of ethanol (50 mM) was evaluated using its specific inhibitor ouabaïn (1 mM). For each group, the number of experiments is specified in the results section. The study is complied with the Guide for the Care and Use of Laboratory Animals, U.S. Department of Health and Humans Services, N.I.H. Publication n° 85-23, revised (1985). 31P and 13C NMR spectra of liver were recorded on a Bruker DPX-400 spectrometer operating at 9.4T (161.9 and 100.6 MHz respectively). For 31P NMR spectra without proton decoupling, 240 free induction decays (70° flip angle, 0.2 s acquisition time, 0.5 s total recycling time, 10000 Hz spectral width and 4 K data points) were routinely acquired within 2 min, except during the periods corresponding to the addition of the ATP synthesis inhibitor where the number of scans was reduced to 70 FIDs to increase the accuracy of the rate determination. 13C NMR spectra (500 FID, 66° radiofrequency pulse repeated every second, 25000 Hz spectral width) were proton-decoupled using a gated bilevel mode, with a high level of 1H irradiation used during acquisition and a low level during relaxation delay. A Lorentzian line broadening of 15 Hz was applied prior to Fourier transformation by the Bruker software for both 31P and 13C NMR spectra. Peak assignment was done as previously described  using methylene diphosphonic acid (MDPA set at 18.40 ppm) as an external standard and glycerophosphorylcholine as an internal standard set at 0.47 ppm.13C chemical shifts were expressed from an external silicone reference (at 1.45 ppm). Phosphorylated metabolite content [ATP, phosphomonoesters (PME; namely sn-glycerol-3-phosphate)] amount were estimated from their peak areas and expressed as a percentage of the initial value obtained at the end of the 30 min-equilibration period in KHB. In physiological conditions, cellular ATP is mainly in the bound form, especially Mg2+-ATP, corresponding to about 90% of the total ATP . It can be thus interesting to distinguish the two cellular forms (free and bound) of ATP, by the 31P NMR chemical shifts between the α and βATP resonances, which resulted from the binding of divalent cations (Mg2+) to ATP . ATP (t) =-kt+b, where k is the apparent velocity of the ATP decrease and b the liver ATP content at the beginning of the substrate perfusion. In order to compare all experimental groups, the values at the beginning of ATP depletion were arbitrarily fixed at 100%. 13C NMR quantification of glycogen content at the beginning of the KHB perfusion was performed from a calibration curve established with oyster glycogen (0 to 185 mM glycosyl units). The change of glycogen content was estimated from the C-1 peak area and expressed as a percentage of this initial value. All chemical compounds are provided by Sigma. Changes in intracellular pH (pHi) were determined from the chemical shift of the intracellular inorganic phosphate (Pi) signal using a titration curve constructed at 37°C according to the Henderson-Hasselbach equation . The accuracy of the NMR pHi determination for the same liver was <0.015 pH unit. Liver effluent (3 ml) was collected in order to enzymatically determine glucose (glucose oxidase, Sigma France) excretion at each phase of the protocol. Glucose excretion was expressed in μmoles/min.g liver ww. All results are expressed as means ± SEM. Since the factor analyzed was the nature of the perfusate, one-way analysis of variance (ANOVA) was applied before a t-test (software package statworks, Cricket Software, London). A P value lower than 0.05 was considered to be significant. This work was supported by grants from Institut de Recherche Scientifique sur les Boissons (IREB), contract number 2001/07-renewal 2002. The authors thank Pierre Tissier for his technical assistance and Dr Ray Cooke (Département des Langues Vivantes Pratiques, Université Bordeaux 2) for proofreading the manuscript. MCB carried out the NMR data and wrote the manuscript. Pat. C participated in the design and the financial support of the study. HG and Paul C participated in the design of the study. JLG conceived of the study, participated in its coordination and corrected the manuscript.